Experience the best of Thailand and Laos on this exciting 15-day journey. You'll visit vibrant cities and ancient capitals, war-time memorials and gleaming temples, travel through the jungle, ride on elephant back and learn the wonders of Laotian cuisine. 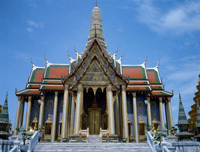 The tour begins in the busy and bustling city of Bangkok, with a tour of the Grand Palace, and an afternoon long-tail boat trip through the peaceful canals of Thonburi, in the west of the city. From Bangkok, we visit a cemetery and museums in Kanchanaburi, home of the bridge on the River Kwai and some beautiful countryside. Also included here is a train journey to the Hellfire pass, where the railway was gouged through the rock by thousands of prisoners of war. Moving on from Kanchanaburi, our next stop is to tour the magnificent ruins at Ayutthaya, one of Thailand's former capitals. These mainly brick-built temples are spread out through parkland on a large island formed by the Chao Phraya & Lopburi Rivers, and formed the heart of one of the world's great cities. We leave Ayutthaya on the overnight sleeper train, heading north for Chiang Mai, where we tour the hilltop temple of Doi Suthep on the outskirts of the city and have some free time to try a cooking course or more sightseeing. Continuing on our way we spend a night in Chiang Rai before crossing the border into Laos and taking a cruise along the Mekong to Pakbeng. The cruise will allow you too see rural Laotian life and visit villages along the way. Leaving the rural Mekong behind we head to Luang Prabang. Once you’ve settled into your Luang Prabang hotel we experience Lao life as it once was with the continuation of alms for the monks, the traditional night market, the beautiful Kuang Si Waterfalls and a number of different temples around the city. Whilst in Luang Prabang you’ll also visit a local cookery school where you will attempt to recreate a local Lao speciality. After spending 3 nights in Luang Prabang we take a scenic drive to Vang Vieng where we spend 2 nights. Whilst here, you will have the option of taking part in activities such as Kayaking, tubing, caving and more. Our final destination for this tour is the capital city of Vientiane where we will spend 1 night. Vientiane is home to Wat Sisaket – which holds thousands of Buddha statues, Wat Prakeo – a formal royal temple, Patuxay Monument – Vientiane’s Arc de Triumphe as well as an option of going to the COPE exhibition centre – which draws attention to the ongoing problem of unexploded bombs, shells, grenades etc.